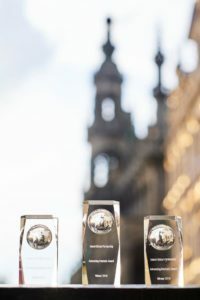 On May 31 in Brussels, Interel hosted the 5th Annual Interel Global Public Affairs Summit Awards Dinner. The awards dinner provides an opportunity for the community to acknowledge the great work Interel Global Partnership (IGP) partners through the presentation of the Advancing Interests Award. Interel’s Advancing Interests Award is granted to successful case studies from the past year that exemplifies innovation and creates the desired outcome for the client. In 2018, Interel received the highest number of submissions yet with the best content and most diverse portfolio of client work. A panel of expert judges analyzed how IGP partners were able to advance clients’ interests in an exciting, creative, and significant way while clearly demonstrating the power of public affairs. Additional points were also awarded to multi-market work. We are excited to present to you this year’s Advancing Interests Award Winners! Interel EU partnered with IGP Partners Imagem Corporativa and Kesarev to create a bespoke wargame for Danone Early Life Nutrition. With the specialist production support of Scenarios4Summits, the wargames prepared local Danone public affairs teams to manage potential regulatory developments. The project involved strategic insights, video creation, engagement tactics, and multi-market, multi-function work across Danone’s key markets. Communication Matters created a strategic campaign to support a recently founded association from the entertainment industry. Their efforts focused on raising the public profile of the organization and seeking to establish new regulation for the association in its respective market. Core of the strategy was a general reframing of the debate by highlighting socio-political consequences and building new alliances. As of result of campaign, new policies are being negotiated at high-levels of government and the group has built powerful stakeholder allies to assist in future regulatory contentions. Grupo Estrategia Politica (GEP) worked with the National Association of Manufacturers of Chocolates and Sweets to develop a public affairs campaign that would demystify the impacts of chocolate consumption, mitigate the relationship between chocolate in obesity, and improve its image to consumers and policy makers. GEP designed a brochure to position the historical and cultural relevance of cocoa and chocolate in Mexico, as well as their relevance in the regional economy. Because of this campaign, GEP achieved many of the goals they established for their client including a positive change in the perception of chocolate in Mexico and the establishment of valuable alliance in Congress, the Executive Power, State and Municipal Governments. On behalf of Interel and the entire IGP community, we would like to congratulate all our winners and submissions on a successful year and look forward to seeing more of your great work in 2019!